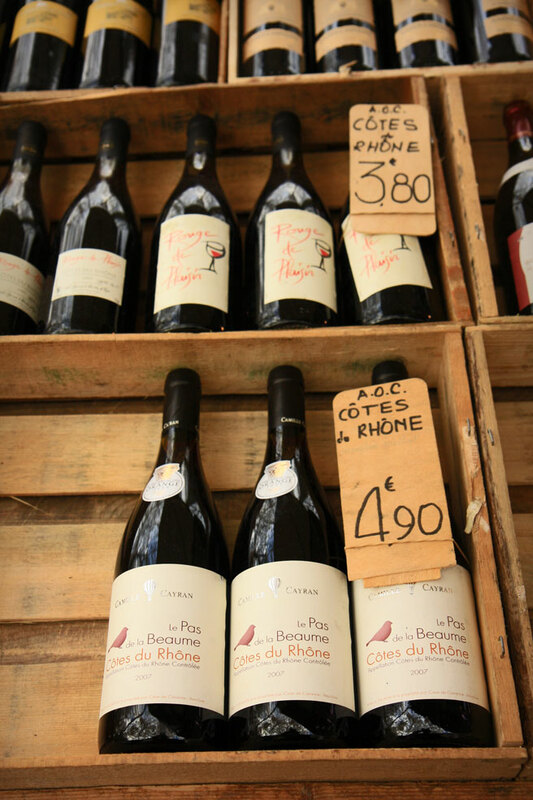 When you visit Lyon, you will make your list of markets to visit, depending on where you're staying or how much time you have. 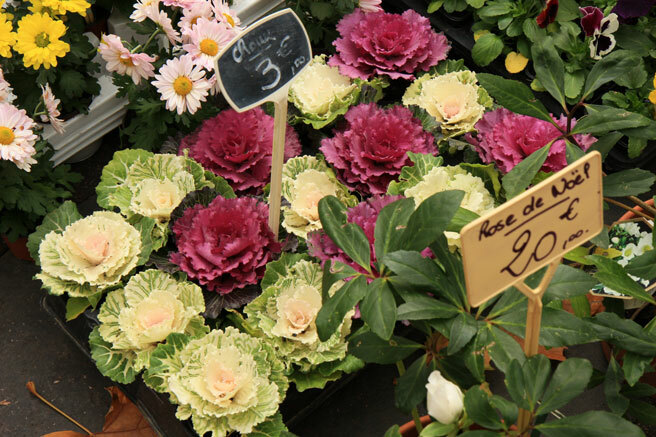 Anyone with any sense programs a jaunt one morning or afternoon to Les Halles on Cours Lafayette, and then there are the outdoor markets, which vary in character throughout the week. Visitors who like to cook, or would like to learn to cook can rent apartments with kitchens so that they can take advantage of the variety of pickings from the region, and have a chance to experience the greatness that Lyon has to offer at home-cooked prices. 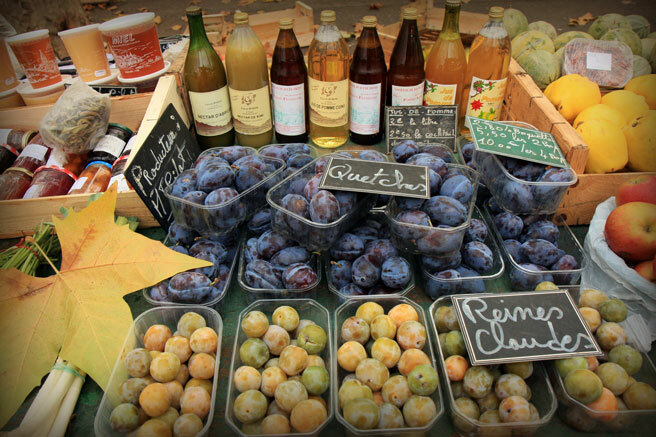 For a food enthusiast, harvest time is the absolute best time to visit the city of Lyon. 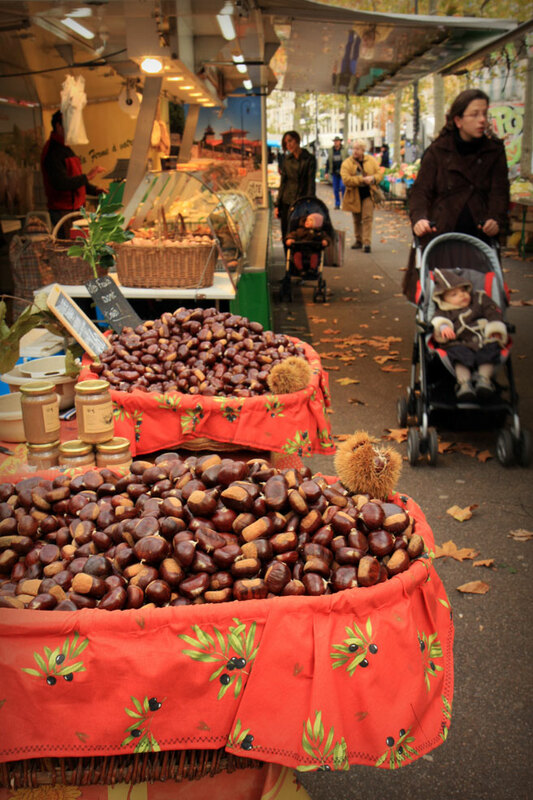 Among other bounty, once you reach deep into Autumn, you can sample the wild game coming to the markets. 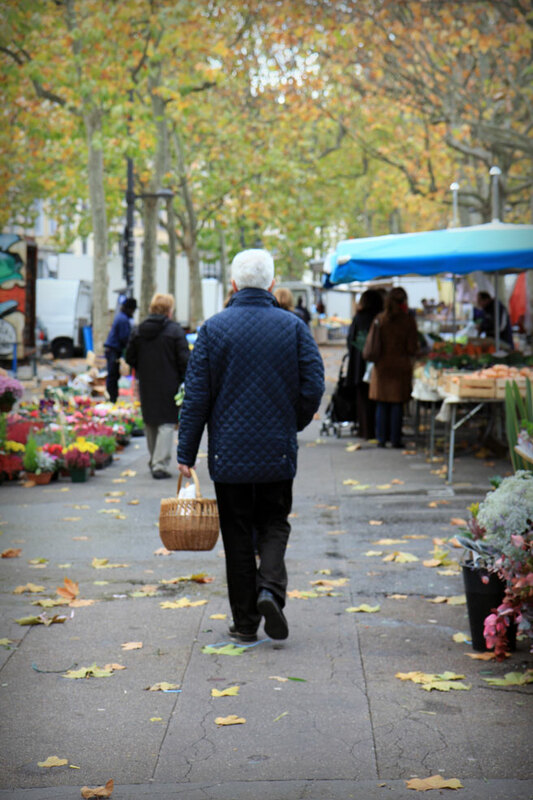 This morning, at my market on Quai St. Antoine, my poultry seller had 6 types of wild game birds to choose from. While I was at her stand, I saw that a client also came up with a sack of partidges from her husband's hunt asking that they process them, a service for which she pays a fee. 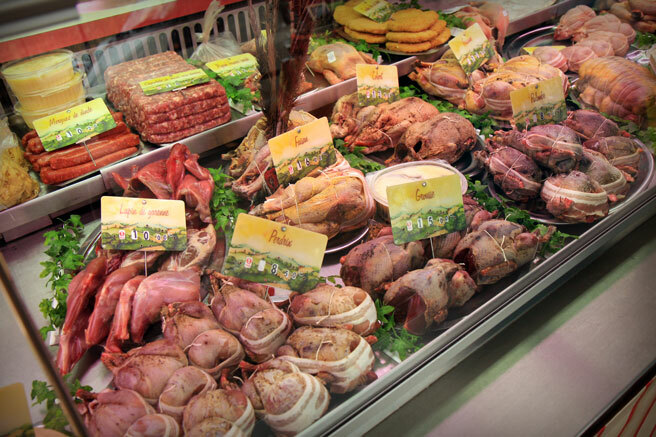 If you go to Les Halles, you can get boar and venison, plus a host of good wild rabbit and duck. I decided to get just one plump little grouse this time, and will serve it to Loic tonight, rubbed with duck fat and wrapped in grape leaves, spatchcocked, roasted and served over toast which has been spread with butter seasoned with the bird's liver and a bit of cognac. (there is your recipe, but if you want ratios, I'll give you one below!) In 2002 I read how Louise Bertholle did her partridge, and it inspired me to create my own recipe for grouse, replacing the barding with a slather of duck fat, tweaking the liver butter seasonings to our tastes. It remains a pillar of my Kitchen Notebook's little game bird recipes. Today's grouse will be a nice way to begin a simple meal, filled out with an autumn soup and followed by the cheese plate, just enough to give us a taste of the season. - Cut the empty bird with poultry shears along the back, spreading the bird flat. Rinse the bird and dry thoroughly. Mix 1/2 teaspoon of fleur de sel into the duck fat and stir it gently to mix. Slather the salted duck fat all over the bird, top and bottom. Top with a grind of pepper, and wrap the entire flattened bird with grape leaves. If you don't have fresh leaves, never fear, you can use the ones that come brined for stuffing, but you have to rinse them well to remove the salt. - Grease a shallow roasting dish that is big enough to hold the flattened grouse, and place it down on the bottom of the dish, breasts up. Roast in a 200C/400C oven for 2o-25 minutes, enough to cook the breasts through, but be careful not to overcook it. - While the bird is roasting, saute the veal liver and the grouse liver in the fat, making sure not to overcook, which will make it dry. Season with salt, nutmeg and cognac, then remove from heat and quickly work it into the butter with blender or by hand with a fork. Chill the mixturein the freezer for 10 minutes. - Toast the slices of country bread, and spread the liver butter on them. 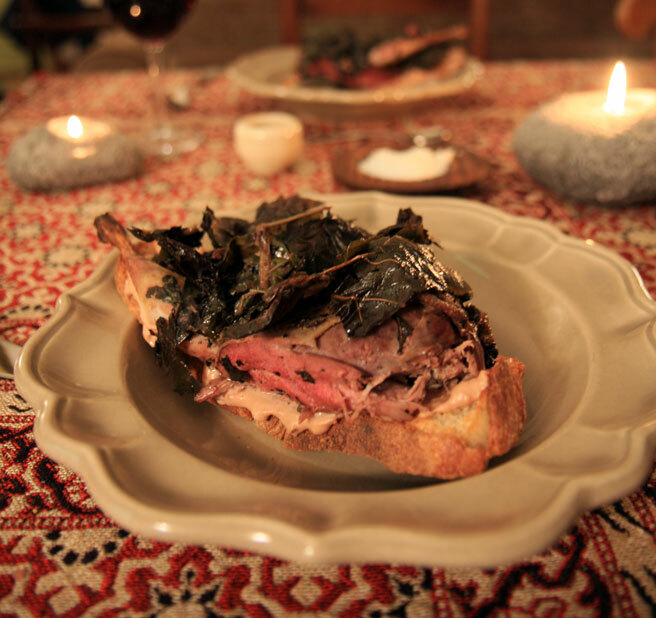 Place the liver toasts on the serving plates, adding half the roasted grouse on top, grape leaves and all. (put the plates in the oven with the door open to keep them warm while you make the sauce.) Deglaze the roasting pan with a quarter cup of water, and reduce it to a tablespoon. Whisk in a teaspoon of butter into the sauce, season with salt to taste and pour over the grouse. Serve hot with a wedge of lemon. 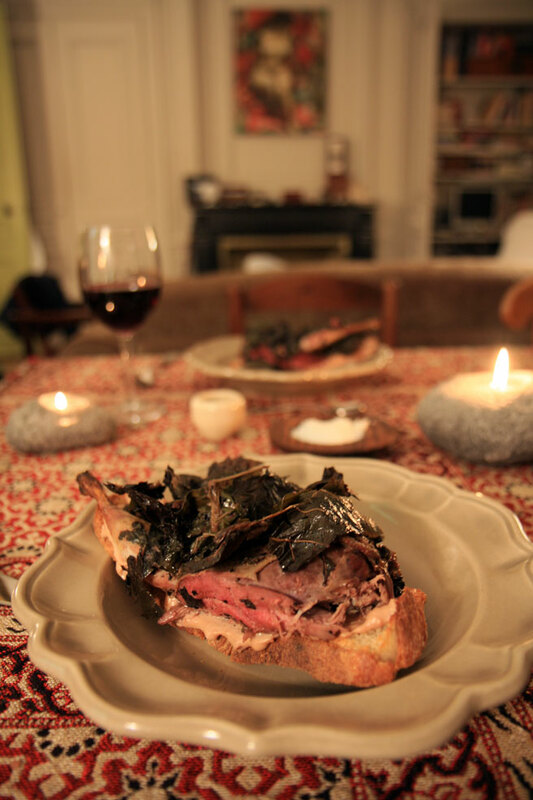 I love squab roasted with ceps. How does the flesh of grouse compare. Darker, stronger flavoured? Dillon, squab and ceps seem like a great combination. Grouse has very flavorful very dark meat. When you eat squab you understand the meaning of game. I find it exciting to eat. We had grouse a fair bit as a kid, back when dad hunted up at our cabin in the interior of BC. The only thing I didn't like about them was picking the small bits of buck shot out of the flesh. Some ceps would have been nice. Our poultry lady did a very good job.